Cup of Excellence is the most prestigious competition and auction for high quality coffees. The level of scrutiny that Cup of Excellence coffees undergo is unmatched anywhere in the specialty coffee industry. Each year, thousands of coffees are submitted for consideration, with winning coffees sold in global online auctions at premium prices, with the vast majority of auction proceeds going to the farmers. Since 1999, the Cup of Excellence (COE) program has set the standard for the increased premiums that farmers have been able to receive for their exemplary coffees. It continues to build a much more transparent infrastructure and gives farmers the tools needed to improve the economic model of their farms. COE raises funds for coffees farmers in coffee growing countries incentivizing and motivating farmers who know there can be a recognition and financial reward for their hard work and effort. The competition is rigorous, with cupping evaluations conducted over a three-stage process by industry experts: first by a National Jury of about a dozen qualified jurors from the origin country, and then by an International Jury, comprised of approximately 20-25 experienced jurors from around the world. 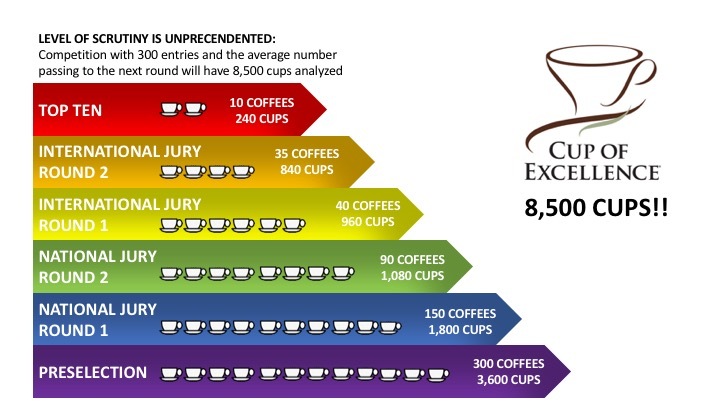 A competition with 300 entries yields an average of 9,000 analyzed cups, with each “Top 10” coffee being cupped at least 120 times. This process ensures elite top-quality consistent coffees enter the COE auction.